Have you ever wanted your plants to tell you when they need watered? Or know how saturated the soil in your garden is? 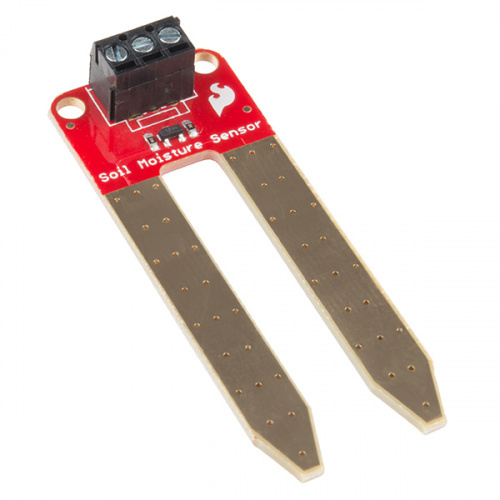 With the SparkFun Soil Moisture Sensor, you can do just that! 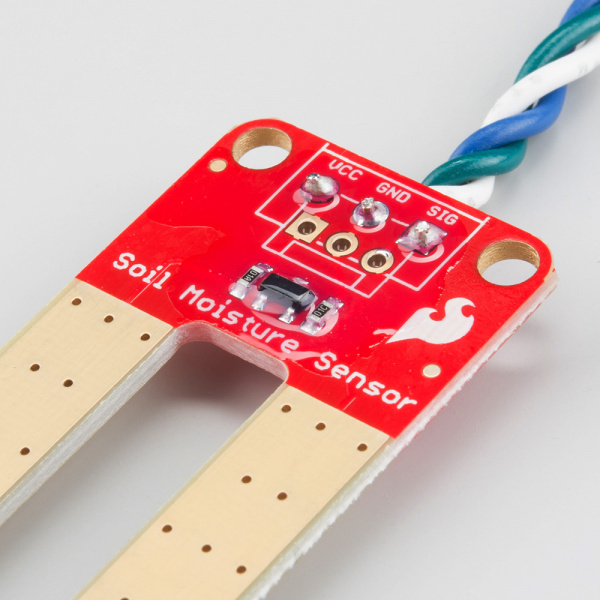 This tutorial will show you how to get started using the Soil Moisture Sensor as well as how to build your own soil moisture sensing project. 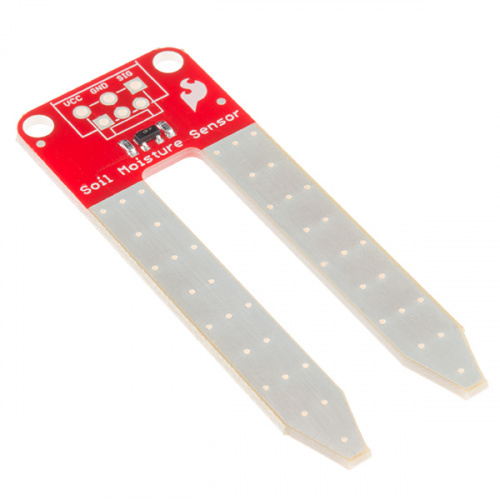 If you prefer not to solder, you can purchase the sensor with a 3-pin screw terminal pre-soldered onto the board. There isn't much to learning how to use the Soil Moisture Sensor. However, you may find the following concepts useful along the way. The Soil Moisture Sensor is pretty straightforward when it comes to hookup. There are only three pins to connect: VCC, GND, and SIG. You need to supply power to VCC and GND. 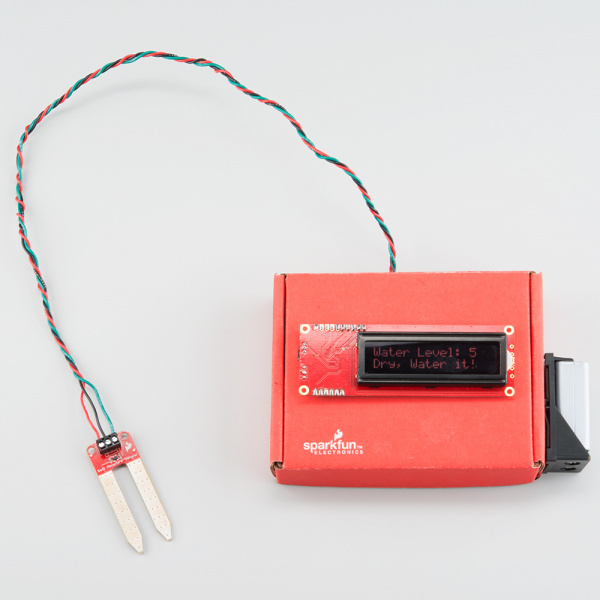 We recommend not powering the sensor constantly to prevent corrosion of the probes (more on this in a bit). SIG provides an anlog signal out that can be attached to the ADC pin on any microcontroller. The value read on SIG will vary depending on the voltage with which you power the sensor. The two probes are acting as a variable resistor – more water in the soil means better conductivity and results in a lower resistance and a higher SIG out. Your analog readings will vary depending on what voltage you use for Vcc as well as the resolution of your ADC pins. We recommend powering the Soil Moisture Sensor with between 3.3V - 5V. Please note that the analog value returned will vary depending on what voltage is provided for the sensor. One commonly known issue with soil moisture senors is their short lifespan when exposed to a moist environment. To combat this, we've had the PCB coated in Gold Finishing (Electroless Nickel Immersion Gold). Another way to extend the lifespan of your sensor is to only power it when you take a reading. Using a digital pin set to HIGH on an Arduino, for example, is an easy way to accomplish this. If you wish to power the sensor with more than a digital pin on your microcontroller can provide, you could always use a transistor. 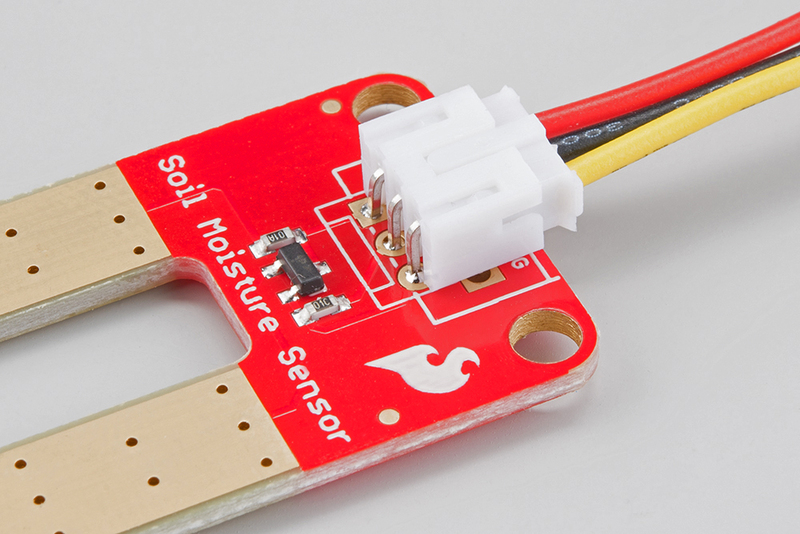 If you bought the Soil Moisture Sensor that already has the 3-pin screw terminal attached, you may skip this section. As for connecting the senor to your circuit, we've given you a few different options. 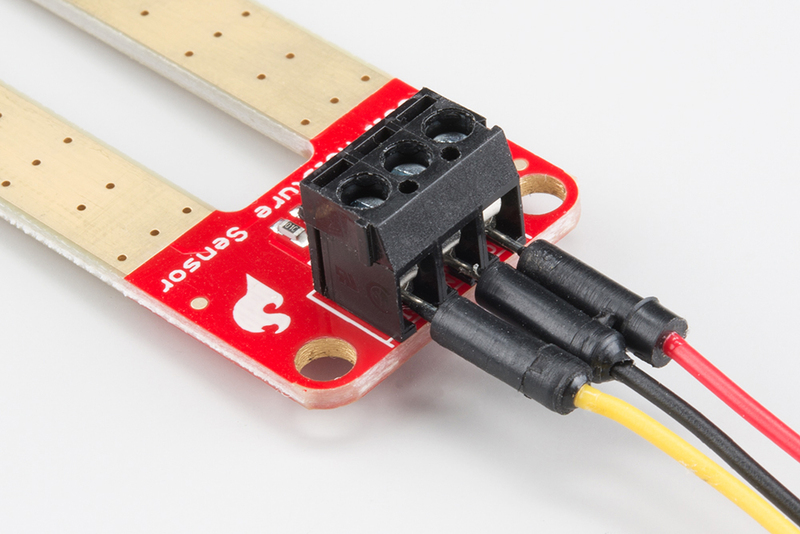 You can solder on a 3-pin JST Jumper Wire Assembly if you need to easily switch sensors on your project. This pairs nicely with our JST to Breadboard Jumper connector. Another option is to solder on a 3-pin 3.5mm Screw Pin Terminal for a slightly more robust connection. Of course, you can always solder some hookup wire straight to the sensor. Wires have been soldered to this sensor. All the SMD parts and solder joints have then been covered in conformal coating. 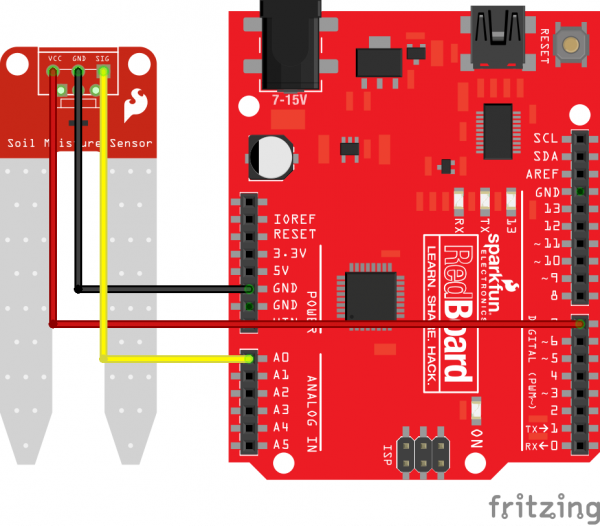 For this first example, we will connect the sensor to a RedBoard or other Arduino-compatible board in a minimalist fashion to show its output over the serial terminal. 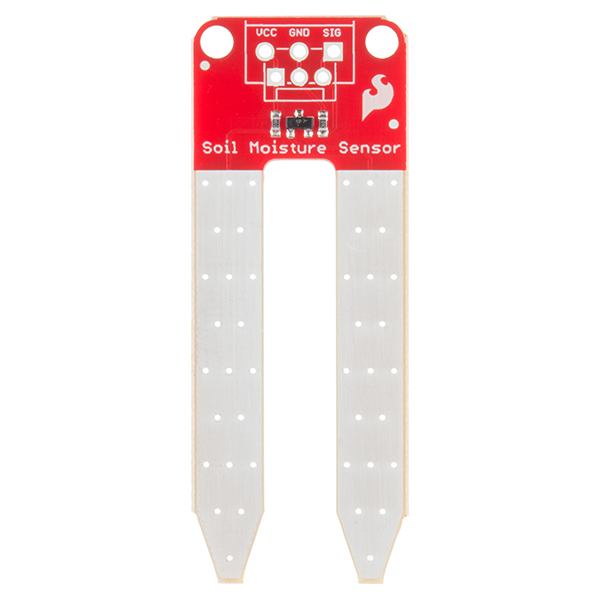 Connect your Soil Moisture Sensor to your board as shown in the diagram below. Once the circuit is built, upload the following code to your RedBoard or Arduino. If you've never used the Arduino IDE before, please visit our tutorial. Note that in the code, we are powering the soil moisture sensor with a digital pin on the RedBoard, not directly from 3.3V or 5V. Since this is a 5V device, the digital IO pins have a HIGH voltage of ~5V. Once the sketch is uploaded, open a Serial Monitor window to see the output from the RedBoard. You should see a value at or close to 0 when the sensor is not touching anything. To see it sense moisture, you can grab both probes with your hand. The moisture from your body will be enough for the sensor to detect. To get any sort of useful data out of your Soil Moisture Sensor, it is advised that you calibrate it to whatever soil you plan to monitor. Different types of soil can affect the sensor, and you may get different readings from one composition tot he next. Before you start storing moisture data or triggering events based on that value, you should see what values you are actually getting from your sensor. Using the sketch above, note what values your sensor outputs when the sensor is completely dry vs when the sensor is completely submerged in a shallow cup of water. Depending on what microcontoller you're using, the operating voltage of that microcontoller, and the resolution of its analog-to-digital converter, you're results will vary. For example, using the same circuit above, if I detach the VCC pin from D7 and attach it directly to the 5V supply on the RedBoard, you'll see the close to the following values in the serial monitor when the senor is dry (~0) and when it is completely saturated with moisture (~880). 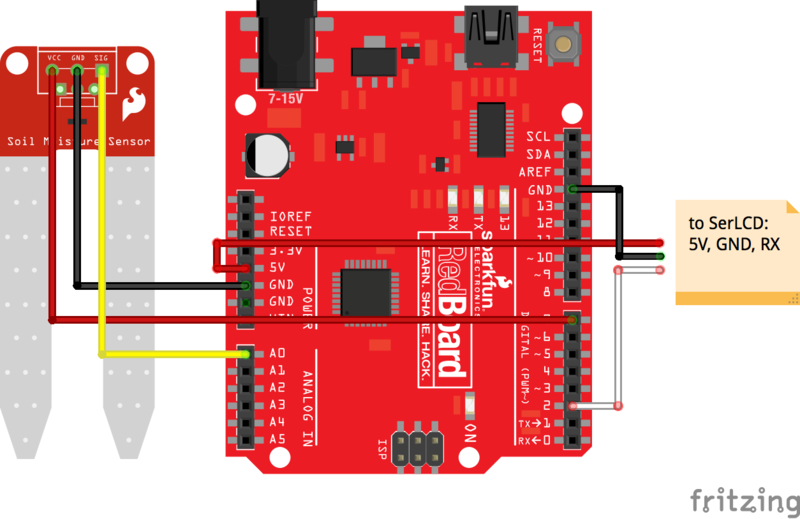 But, if I take the VCC pin and connect it to the 3.3V supply on the RedBoard, the values change. As expected, they get lower since there is less resolution between 0V and 3.3V than there is between 0V and 5V. Thus, it is difficult to write an example sketch that works for all platforms. It really depends on the operating voltage and ADC resolution of the board you're using. Once you have an idea what values your sensor is outputting in completely dry and completely wet situations, it's time to calibrate your sensor for the specific soil you want to monitor. Do the same test above, only this time test your soil when it is as dry as possible, then measure it when the soil is completely saturated with moisture. Getting these values and comparing them to the ones from the previous calibration will give you the best insight into what values mean for your specific plant and soil. This test may take some trial and error and patience. Be careful not to over-water (or under-water) your plants during these tests. For this next example, we're going to make a portable soil moisture sensor that will print the current moisture value to an LCD screen. We'll use the circuit from the previous example. This time we just need to add a Serial Enabled LCD Screen and portable power. Along with the soil moisture sensor, we have connected the LCD screen to 5V, GND, and digital pin 2 (D2) for serial communication (also can be changed in the code). Feel free to put your circuit in an enclosure of some sort. A SparkFun red box makes for a great project box. For this project, we are powering the ReadBoard with a 9V battery and 9V battery holder to make it portable. The code for this is fairly straightforward. You will need the Software Serial library to interact with the serial LCD screen. If you do not have this library you can get it from the Arduino GitHub here. If you have never uploaded a library or want a quick refresher on how to do that, check out our tutorial here. Installation should not be necessary, as this library now comes with the Arduino IDE by default. // for the display. This prevents display corruption when uploading code. // your soil type and environment. // wet or dry based on our threshold values above. This code has different values for an upper threshold and a lower one, so you have a middle zone that could either be wet or dry depending on whether the soil is drying out (coming down from being wet) or getting wet (coming up from being dry). If you don't want this middle zone, you can set both thresholds to the same value, but I have found that having this middle area is more similar to how soil actually works; there really isn't a point at which soil goes from being wet to dry. If you are interested in soil and how it reacts to water, you should read up on it; it can be very complicated and interesting. You will need to adjust the code variables anyway, since this will be unique to your setup, soil type, and how wet you actually want your soil to be. Using the calibration techniques mentioned above, test out the reading and play around with the values until you find some that fit your needs.